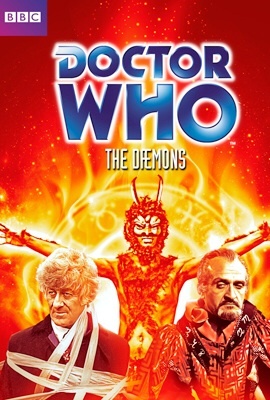 I’ve recently watched the exciting classic Doctor Who story The Dæmons, this sees the Third Doctor, (Jon Pertwee) and companion Jo Grant (Katy Manning) dispatched along with the United Nations Intelligence Task Force (UNIT) to the village of Devil’s End during The May Day celebrations. Here they discover that an archaeological dig is excavating the infamous Devil’s Hump, a Bronze Age burial mound. A local white witch, Olive Hawthorne arrives to protest, warning of great evil and the coming of the horned beast, but she is dismissed as a crank. So she goes to see the new local vicar, Rev. Magister, who tries to reassure her that her fears are unfounded. However Reverend Magister is hiding a secret and turns out to be The Master (Roger Delgado) who is conducting Black Masses in the cavern below the Church to summon up an ancient an all powerful Dark entity named Azal, who is actually an Alien called a Dæmon, this has rather alarming consequences and could mean the end of the World. The Doctor is then captured by a mob of villagers under the influence of The Master who decide to burn him alive, however Miss Hawthorne and Benton rescue him. Meanwhile Jo Grant AND sgt. Yates return to the cavern to stop The Master’s evil plans, but are taken prisoner as He summons Azal again and Jo is prepared as a sacrifice. Meanwhile a Stone Gargoyle named Bok has been brought to life and is guarding the Church, but the Doctor Manages to creep past him as he gets to the cavern, however Bok clobbers a few UNIT Troops. In the cavern The Doctor and the Master encounter Azal who decides to give his power to the Master, and clobber the Doctor…. International Children’s Day is celebrated on June 1st in Armenia, Azerbaijan, Bulgaria, China, Czech Republic, Kazakhstan, Laos, Myanmar, Mongolia, Mozambique, Nicaragua, Poland, Romania, Slovakia and Vietnam, in order to honour children globally. It was first proclaimed by the World Conference for the Well-being of Children in 1925 and then established universally in 1954 to protect an “appropriate” day.Major global variants include a Universal Children’s Day on November 20, by United Nations recommendation. Children’s Day is often celebrated on other days as well. International Day for Protection of Children, observed in many countries as Children’s Day on June 1 since 1950, was established by the Women’s International Democratic Federation on its congress inMoscow (22 November 1949).Children’s Day observations in the United States predate both Mother’s and Father’s Day, though a permanent annual single Children’s Day observation is not made at the national level. So far Depeche Mode have had more than 48 songs in the UK Singles Chart including “Enjoy the Silence” “Policy of Truth” “Personal Jesus“ “World in My Eyes””Never Let Me Down Again” and “Walking in My Shoes” twelve top 10 albums in the UK charts, two of which debuted at #1. According to EMI, Depeche Mode have sold over 100 million albums and singles worldwide, making them the most successful electronic band in music history. Q magazine calls Depeche Mode “The most popular electronic band the world has ever known” and included the band in the list of the “50 Bands That Changed The World!”. In 2010 Depeche Mode were ranked No. 98 on VH1′s list of the “100 greatest artists of all time”. Martin Gore has also recently released a solo album called MG.